Well we were finally discharged. Now we are headed to the rmh. 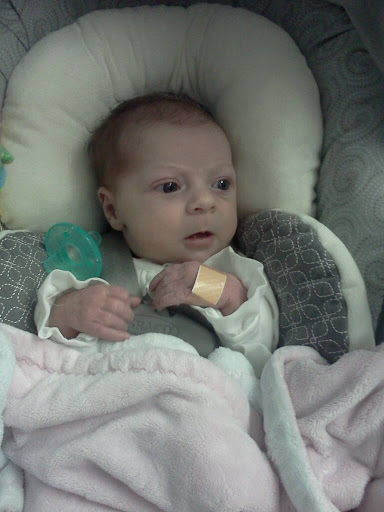 Olivia in her first car seat ride. Congratulations! This is such a nice Thanksgiving gift. What an absolutely perfect Thanksgiving Day you all will be having. Congratulations! That is GREAT news. I hope ya'll are able to finally get some alone time with her. Will continue to pray for everyone. Yay, hope you're able to get some sleep tonight! I remember our first night with Zoe out of the hospital, like it was yesterday. Email us anytime! Now that is something to be thankful for. We will keep you in our prayers! So happy for you and your family! What a glorious gift on Thanksgiving! HOO-RAY!!!!!HOO-RAY!!! WHAT A WONDERFUL DAY!!! !